The first time I ever saw this book, I thought, "oh, just another fitting book," but I soon found out otherwise! No more slashing, tucking, and folding patterns struggling to get just the right fit. 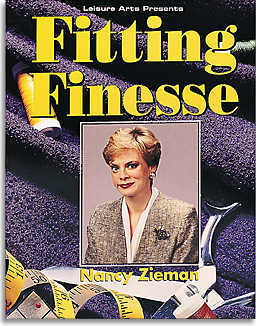 In this book, sewing expert Nancy Zieman presents her unique "pivot-and-slide" technique for pattern fitting. Sew dresses that fit! A fun fitting alternative to get you done with fitting and back to sewing! If you want to sew clothing that fits well, custom-fitting your pattern is well worth your time...this book shows you how! Softcover book, 144 Pages.